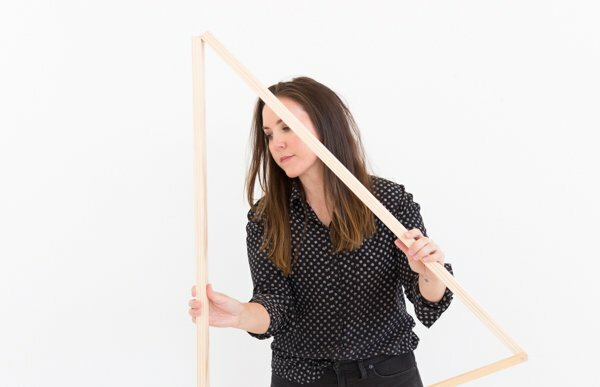 This contributor post was written by Katherine of Making Chicken Salad. In my opinion there can never be enough of the following in our home: storage solutions and layers of pattern. 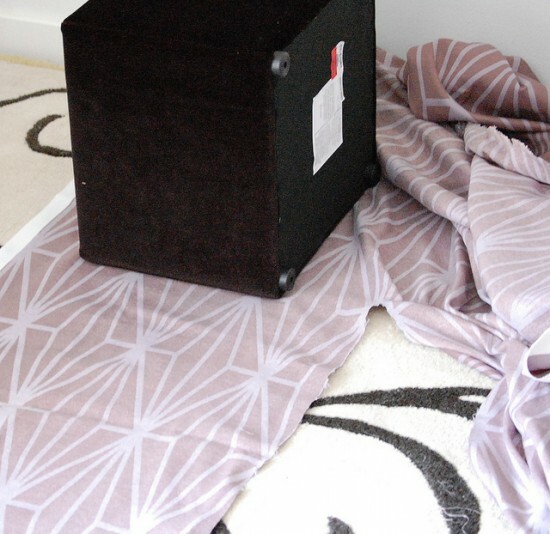 These DIY ottomans are super easy and fulfill both of those criteria! And, at less than an hour put together they make a perfect Saturday morning project. Here are the materials you will need: 1. Plain storage ottoman. 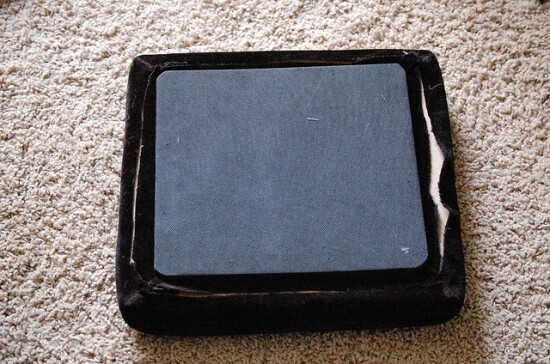 For those pictured above I used one microfiber ottoman and one velvet one with rhinestone buttons–they were both pretty ugly to begin with but at less than $15 each they are perfect candidates for a makeover; 2. 2 yards of fabric; 3. piping in a contrasting color/pattern; 4. staple gun & plenty of staples; 5. upholstery tacks & a hammer; 6. either a sewing machine or a hand sewing needle and thread. 1. Let’s start with the base of the ottoman. 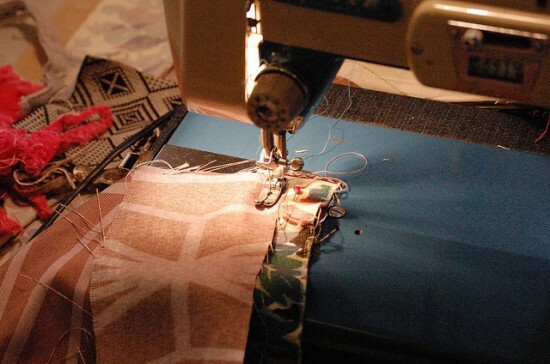 Use your otttoman as a pattern to trace and cut out your fabric. Do this by measuring the width of one side, then multiplying that measurement by four and adding six inches. 2. Place your ottoman on its side on the long piece of fabric and bring the edge up and over the top. Place a few staples to keep the fabric in place. 3. Tightly pull the other edge of the fabric around the ottoman, with the raw edge folded under. 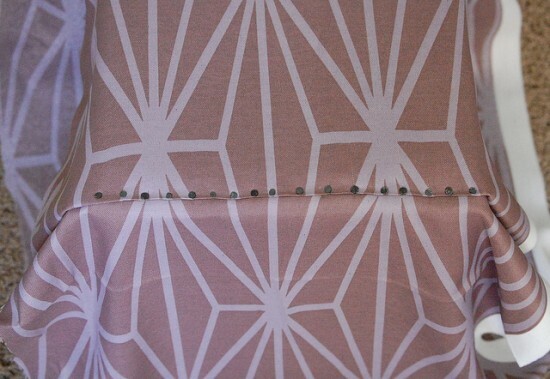 Pull the folded fabric right over the staples you placed. 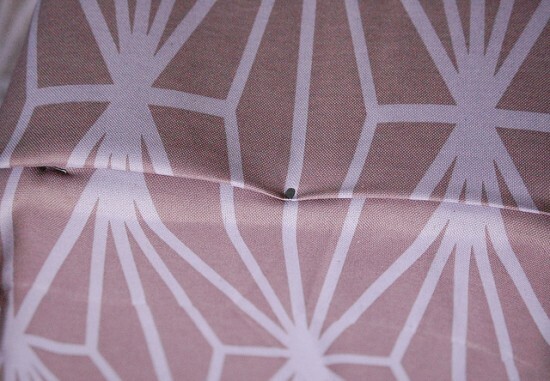 Nail one upholstery tack into the center of the edge, and then one in each corner, pulling the fabric taught as you go. 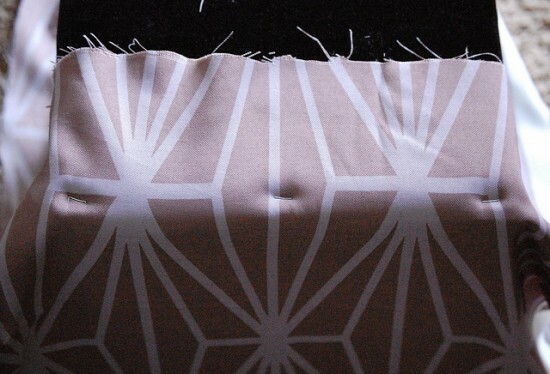 Once the fabric is held securely in place, fill in the rest of the edge with tacks. 4. Flip the ottoman upside down so the bottom is facing up. Tuck the raw edges under and staple all of the way around. Depending on the style of your ottoman you can either tuck and staple around the feet, or loosen the feet and tuck the fabric underneath, as I did. 5. Stand the ottoman on its feet, right side up. Tuck the raw edges of the fabric under and fold over the top of the ottoman. Staple the fabric to the inside of the of the ottoman, all of the way around. The base is now finished & you are ready to move onto the lid. 6. 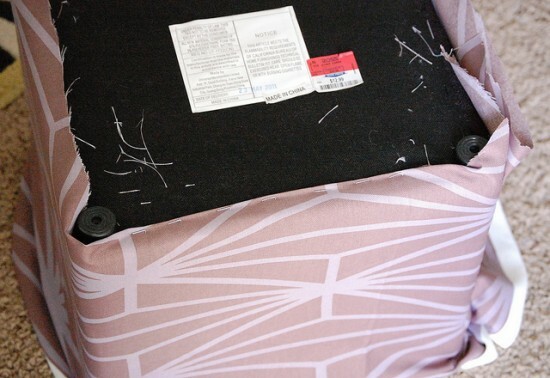 Place the ottoman lid upside down on your work surface and slice all of the way around the edges so that you can easily peel the fabric off to use as a pattern. Cut one square center piece and four edge strips the exact same sizes as the pieces of the original lid covering. 7. Sandwich the piping in between the edges of the center piece and each of the edge pieces, and stitch around the perimeter of the fabric. Then, stitch the ends of each of the edge pieces together. 8. Place the new cover over the lid, fold the edges under, and staple all of the way around the inside edge of the lid. Your finished product will look much better if you are sure to keep the fabric taught as you go. And, you are done! 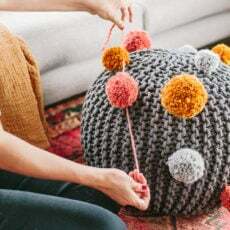 this is so awesome.. i love ottomans, especially when theres storage, but i can never find an affordable one that i love. now, all i have to do is find the right fabric. 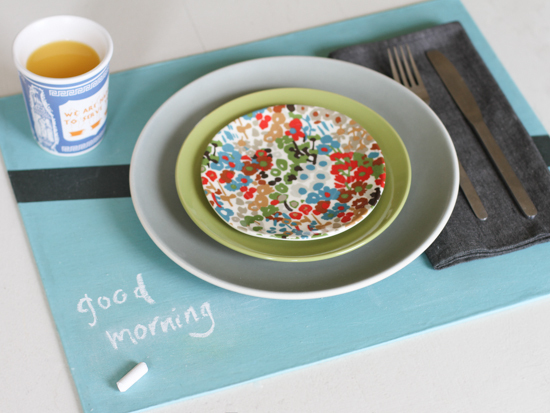 thanks for this diy <3 this blog is always so inspiring! the ottoman looks great!! You should never let a piece of furniture at a good price go just because you don’t like the fabric! It’s too easy to change! 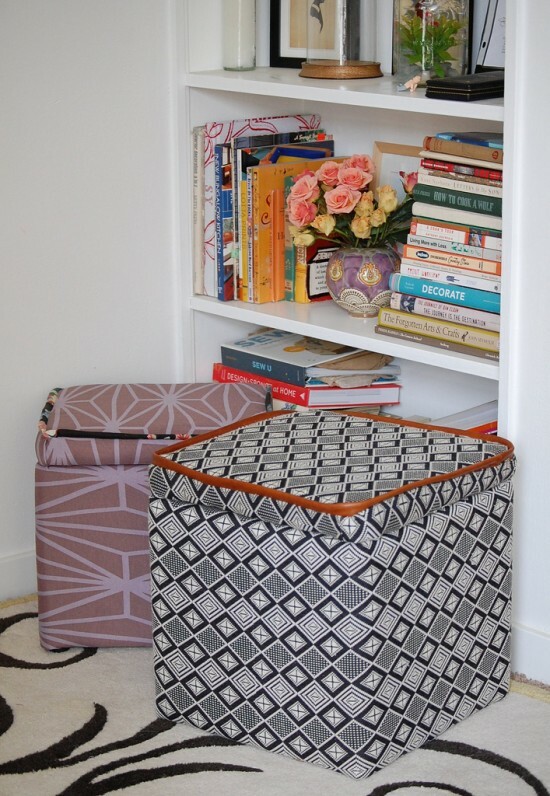 Where did you get the plain storage ottoman at such a cheap price?? I’ve looked everywhere and can’t find one for under $30. 🙁 Please share any ideas 😀 THANKS! Hey Stefanie! Just in case Katherine isn’t able to answer this herself…It looks like she got them at discount store like Ross based on what I can see from the sticker on the bottom. Let me know if I am wrong Katherine. 🙂 You may even be able to find something similar at a yard sale or estate sale if you can wait – that’s where I get all my super bargains. Good luck! Oh perfect! I’ll definitely keep checking Ross and wait for Summer to come for all the great garage sales. Thank you! Brittni hit the nail on the head! The velvet ottoman did, indeed, come from Ross & was $12.99. The microsuede ottoman came from Target and was on sale for $15 (originally $25). Definitely keep an eye on the thrift shops and yard sales–these things are readily available and there is no need to spend more than $20. I bought a very similar one at Target for $15. I’m going to do this as soon as I find the right fabric! Can’t wait. Quick question: Are the upholstery tacks visible on the one edge? 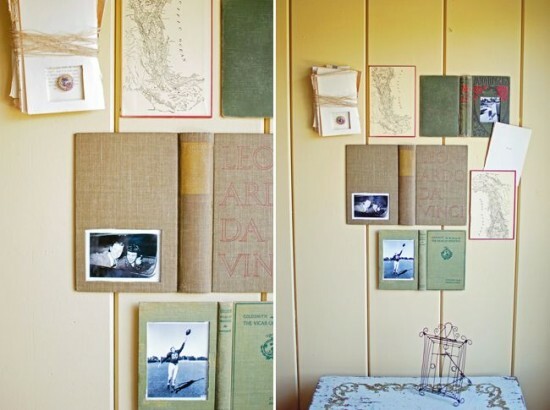 I love this idea, but might use nailheads if they are left uncovered. Thanks! Good question Molly. I can’t tell based on the photos. Maybe Katherine will chime in with the answer to this one. What a fab idea, I’ve got an old ottoman that I was going to throw out as it doesn’t match anything in my home. But now I’m going to give your tutorial a try and recover it. Hope it turns out as well as yours did. At last! i’ve been hunting on line for instructions to re-cover my 2 ottomans and couldn’t find a thing, until i found this 🙂 loving these little ones, how cute are they?! my two are a meter long and my delightful terrors (aka, darling chrildren) have ripped the fabric off of one. bizare how it could have lasted my though my mother as a child, me and my siblings as children (so thats a good 60 years! ), yet 20 minutes with my two and its ripped :/ opps…time to get rid of the vomit green and gold stripped material (it was re-covered once in the late 60s, I say thats still no excuse for the colourings!) and I’m thinking of trying to add more foam to the top of both (yes, BOTH are vomit green and gold…) to make them into a box seat/toy box. now to find a way to fix the lids open before the lids drop on their fingers, I seem to recal that being very painful!